Remember: Tutorials can not be completed without the book. Please order the book here. Because of the aforementioned disaster that took place when making my Mrs. Squirrel, I will be giving you some tips to help you through the tutorial that is featured in Christi’s book, beginning on page 10. As I have been doing, you will see that my squirrel looks different from Christi’s in many ways. I would wager to say it is more “me” than Christi. Most noticeably, my squirrel has an obvious lack of mixed media and beaded additions and focuses more on clay sculpture; in addition to that whimsical and playful look that I love. I have not decided whether or not I will antique this little cutie (she’s about 3″ tall, so she’s hardly “little”). I kind of like her just as she is … what do you think? Make it yours. What do you like about Christi’s style? What do you not like about it? 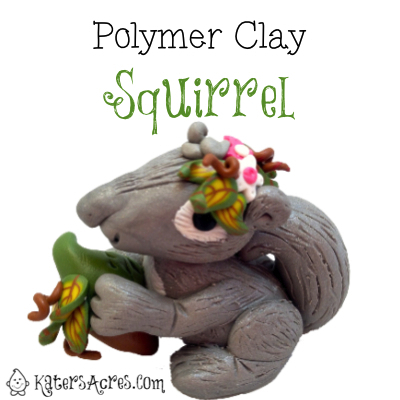 When you make your polymer clay squirrel if there’s something you want to do differently, do it! Add something fun if you want! Since we are in the “Woodland Creatures” book, I decided to add some woodland fun to my squirrel. I added a head wreath of flowers, some handmade millefiori caned leaves, and a few curly twigs. Need a great millefiori caned leaf tutorial? Try this one from ClayGround’s Karen Walker. It’s one of my faves and is easy to adapt and do with just a small skinner blend. Or make it easy on yourself and make it as Karen has. Make cute ears! Often when creating animals and creatures, the fun is in the ears. While Christi’s ears are far more realistic than mine, mine are cute & easy. See the mini-tutorial at right (yes, this picture I was able to retrieve). To make these ears, simply roll a log. Join the ends of the log together. Pinch the ends into a tiny tear drop of a shape. Make a “dent” with a ball tool where you want the ears to be. Insert the tip of the ears into the dent. At first my squirrel was going to be a Mr. Like all things I design and create I let each one talk to me. I also decided that it is NOT a he, but rather a Mrs. and needs some flowers on her head. So I added some bright pink marbled flowers and white flowers too. I also added some hair because everything looks cuter with some whispy hair. Lastly I added some caned millifiori leaves that I whipped up and a couple curly twigs. And now my “He” is a “She” and is much happier about it too! Sometimes change is good. At the point where these photos take over I have already decided that my acorn need NOT have a silver top. You can see that there is a lot of “silver” or “pewter” tones to my sculpture. While this is not bad, it made the acorn get “lost.” I wanted my acorn to stick out and get some attention … so with the addition of a green top, caned millifiori leaves, and a few curly twigs, it’s looking much better. For this week’s project you can create either a squirrel (page 10) or a fox (page 25). What are you going to create? Be sure to come on over to the Sculpting Group and share what you are working on. Your Mrs. Squirrel is so sweet! I myself seem to favor most of my pieces without any antiquing or glaze. Thanks for stopping by and commenting on my turtles! Have a great weekend. Hmmm, fox or squirrel…we’ll see!